Although N.C. Beer Month is coming to an end, restaurants in Greater Raleigh will continue to celebrate local craft brews. 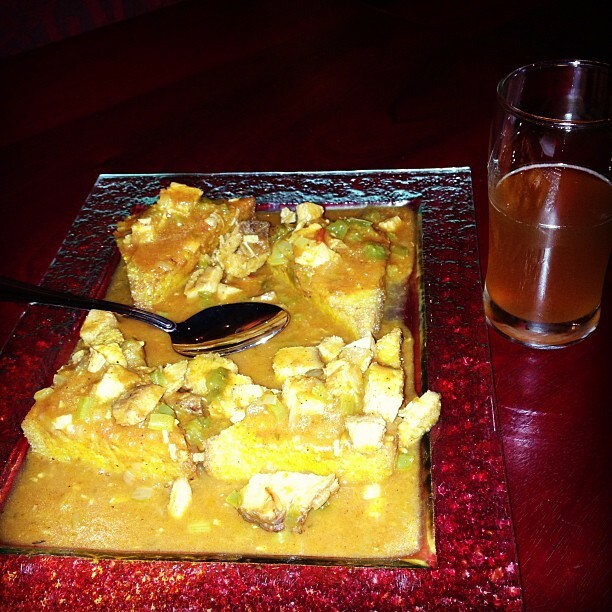 Executive Chef Jay Pierce of Lucky 32 Southern Kitchen in Cary is passionate about N.C. beer. He routinely partners with N.C. breweries to offer unique beer school events. During the beer school events you will learn about the art of pairing food and beer and of course, try delicious food and craft beer. I attended a beer school event featuring Mystery Brewing Company during Apr.&apos;s N.C. Beer Month. 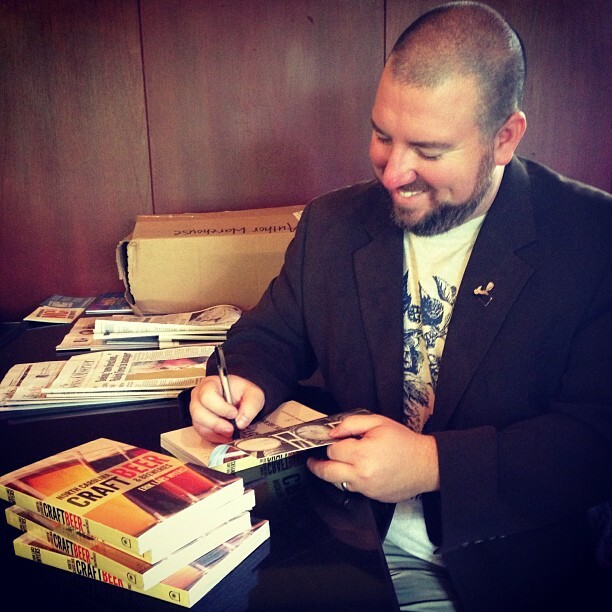 The event began with a book signing with Erik Lars Myers. Not only is Erik the founder of Mystery Brewing Company, but he is the author of "North Carolina Craft Beer & Breweries." After the book signing, we joined Erik and Chef Jay in a private dining room for the beer school. The first course was Chef Jay&apos;s spin on a recipe from a newly released cookbook, "The Lee Bros. Charleston Kitchen." 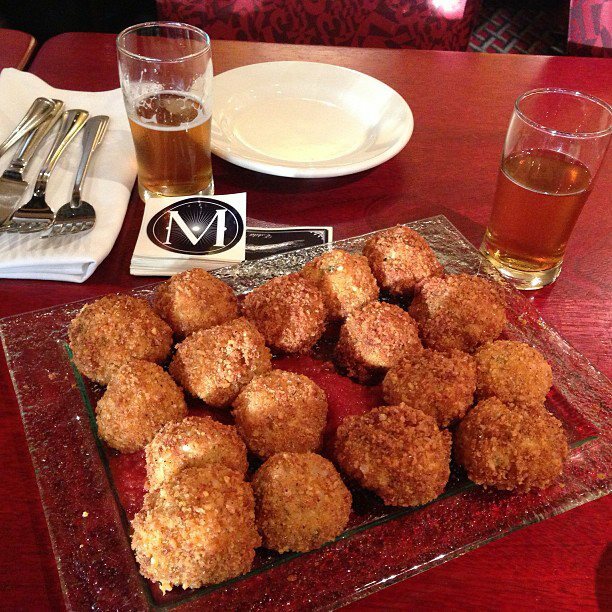 A plate filled with ham and rice croquettes was served to our table with a blonde ale by Mystery Brewing Company called the Gentlemen&apos;s Preference. The tangy tomato sauce and savory flavors of the croquettes paired nicely with the blonde ale&apos;s slight touch of sweetness and hops. I&apos;ll admit, I ate three croquettes. So much for trying to save room for the next five courses! The croquettes were just so delicious, I gave in to this Foodie temptation. The second course was a duck breast pastrami with frisée, Goat Lady Dairy&apos;s chevre and bourbon-cherry vinaigrette. 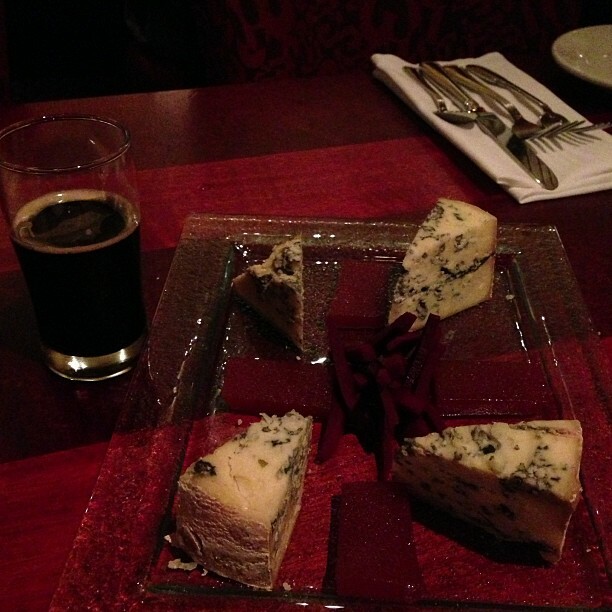 Mystery Brewing Company&apos;s Queen Anne&apos;s Revenge was paired with the second course. 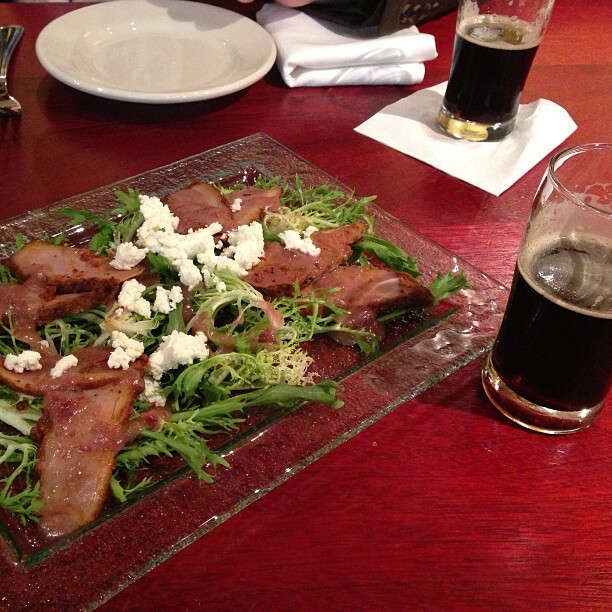 This N.C. beer is called a Carolinian dark, which is a darker version of an English-style IPA. The third course was Chef Jay&apos;s spin on another recipe from "The Lee Bros. Charleston Kitchen." 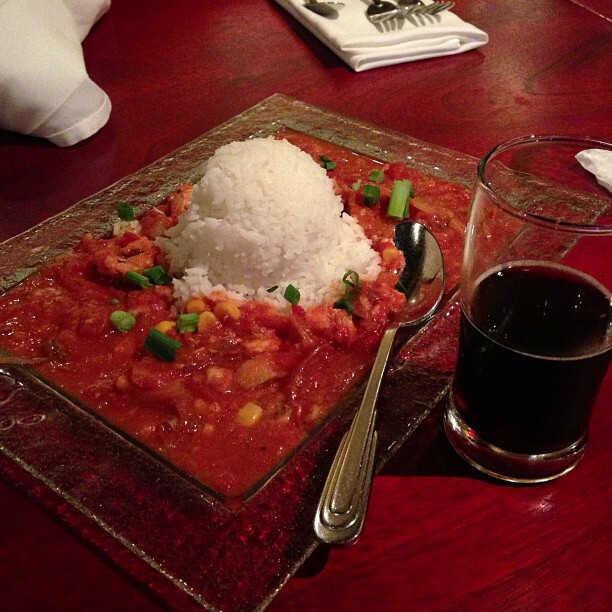 Chef Jay served a catfish stew low country muddle with Mystery Brewing Company&apos;s Pinafore, a Southern English brown ale. Mystery Brewing Company started a homebrew competition and this beer took the gold by homebrewer Matt Matthias. Matt was actually at the beer school event and had the unique opportunity to try his beer for the first time. The fourth course was a turkey mole served with a fried grit cake. The Beatrix spring saison was the perfect compliment to the dish with wonderful fruit flavors for the spring. The crisp citrus flavors accepted the spices well to create what I thought was a beautiful pairing. The next dish threw some of the guests for a spin! Chef Jay paired Bayley Hazen Blue cheese with unique accoutrements like membrillo and ginger pickled beets. The St. Stephen&apos;s Green dry Irish stout&apos;s bitter chocolate and espresso flavors was wonderful with the intensity of the blue cheese. For those of you who don&apos;t know, I am obsessed with Cheerwine. Chef Jay created a Cheerwine cupcake with cream cheese frosting and candied pecans for the last course. 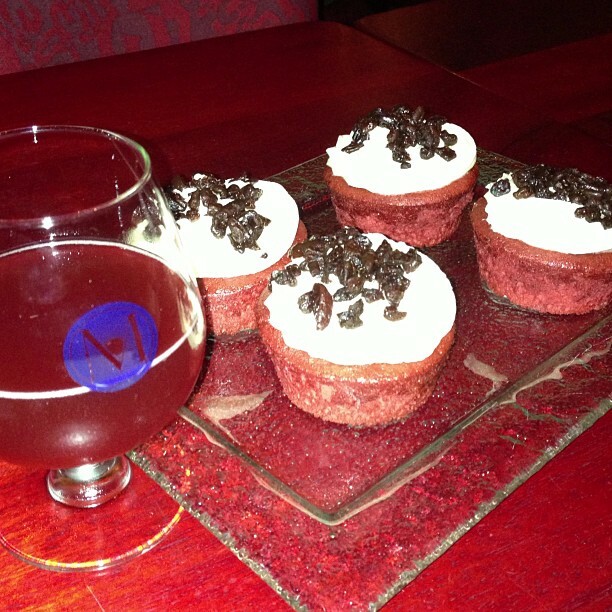 The cupcake was paired with the Mystery Brewing Company&apos;s Fawkes oak-aged ale with cherries. Over 40 pounds of cherries are added during the brewing process and the distinct cherry flavor of the beer complimented the cupcake. Although N.C. Beer Month has come to an end, it doesn&apos;t mean you have to stop celebrating! Check out Lucky 32 Southern Kitchen&apos;s website for upcoming beer schools.